Whether you need to dust hardwood, scrub a sticky stain on tile, or anything in between, the OXO Good Grips Double Sided Flip Mop is all you’ll need to make your floor shine. The Mop features two surfaces: soft, absorbent microfibre on one side and foamed scrubbing surface on the other. The Microfibre side is perfect for dry dusting or quick mopping on many different surfaces, and the scrubbing side is great for tough stains or sticky messes. The large, flat sponge head covers a large surface with every swipe and it’s easy to alternate sides with a flip of the lightweight, aluminium Mop handle. 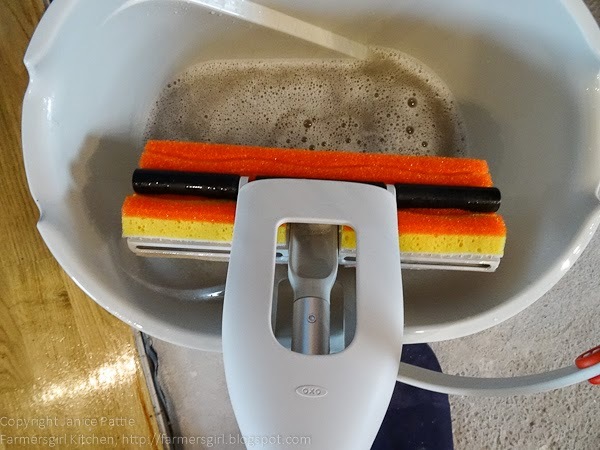 With a push of the comfortable handle, the rollers squeeze out the entire sponge, and when in the closed position, create a stand to keep the Mop upright with the sponge off the floor. Sponge heads are securely attached with Velcro and are interchangeable and replaceable. The Double Sided Flip Mop works really well with the OXO Good Grips Angled Measuring Bucket You can fill, measure and pour with ease with the OXO Good Grips Angled Measuring Bucket. The patented top-view angled surface measures gallons and quarts, eliminating guesswork when filling. Built-in measurements on the bottom of the bucket provide added convenience when measuring smaller amounts of detergent. The large opening accommodates all household mops and the wide spouts allow for controlled pouring. The soft, non-slip handle absorbs pressure from your hand, making it easier to carry and pour when the Bucket is full. The Mop Holder on the bucket handle securely holds your mop upright in storage or when moving from room to room while mopping. 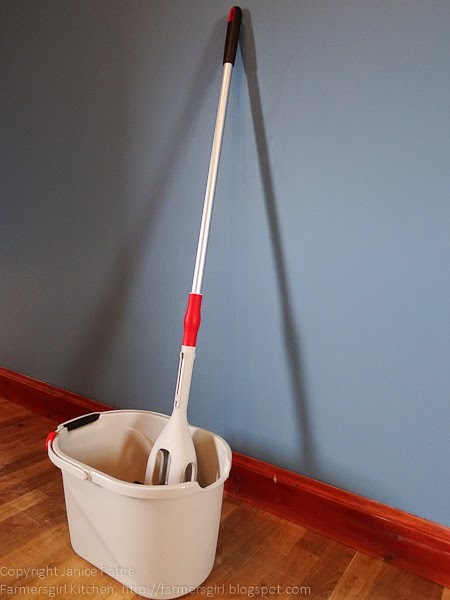 I found the Double-sided Flip Mop easy to use and easy to flip between the soft microfibre side and the gentle scrubbing side when coming upon a stubborn stain. 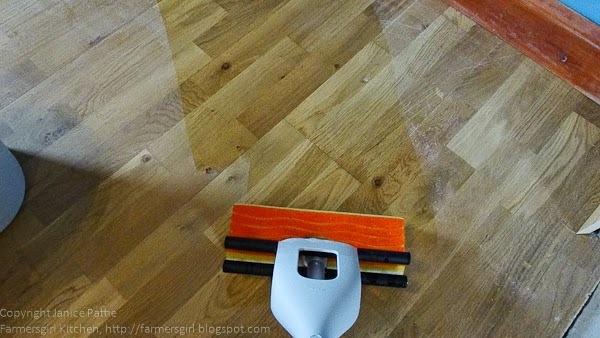 Squeezing out the mop was also straight-forward, I found it best to move the rollers over the sponges slowly to remove as much water as possible, particularly for a wooden floor where you don't want a lot of water left on the surface. All in all it was a very successful mop which worked well on the wooden floor and also on the vinyl in the bathroom. I really liked the way the heads are fitted with velcro which means you can easily remove them to clean them properly and replace them if they wear out. As with all OXO Good Grips products the quality of both the mop and the bucket is very high. They are well finished and feel substantial and comfortable to use. So if you are planning any DIY or Spring Cleaning, then I can highly recommend this mop and bucket. I also love my OXO Good Grips Extending Duster which you can read about in this blog post: Can I do you now, Sir? Many thanks to Zara for her thoughtfulness in offering me the mop and bucket to help me clean up. I was not paid for this post and all opinions are my own. I like the interchangeable facility from the soft cloth to the scrubbing side. These sound great - I could definitely go with some. Seems like a very useful mop! I can't wait to move in to our own house in a couple of weeks time, the only thing I'm afraid of is amount of cleaning and painting and cleaning and painting we have to do! You're very good at what you do. Thanks for being awesome and sharing all the info with us.